An eclectic theme, for outstanding brands. Responsive and colorful, with a touch of eccentricity and grooviness. Responsive & colorful, with a touch of eccentricity and grooviness. Bundled with Drupal Commerce. 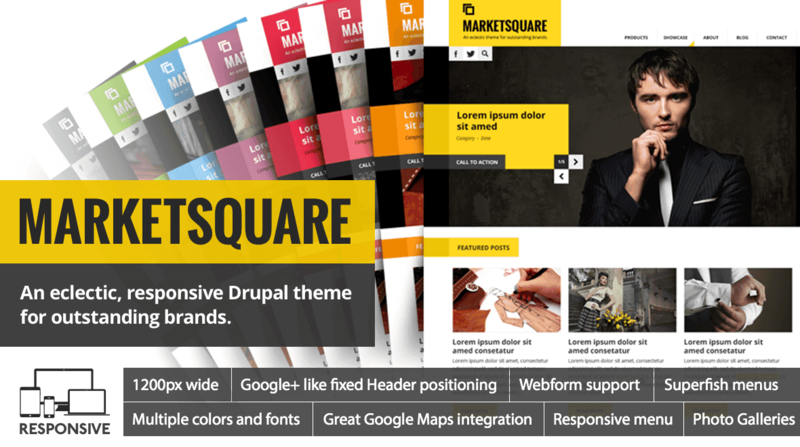 MARKETSQUARE comes with a multitude of pre-configured, responsive column layouts [one-third] [two-thirds] [one-fourth] [three-fourths] [one-half] so you can create pages tailored to your needs. Drive your Slideshow easily with the built-in intelligence. Create “Slideshow entries” or just set your content* to be promoted and Voila! Add text, images or even full HTML. Blog entry, Service, Showcase, Slideshow entry. Enjoy View blocks ready-made for your ease: Services, Latest Services, Showcases, Client Showcase, Latest posts, Promoted posts, Slideshow, Twitter Updates & Testimonials and yet much more. With its built-in installation profile it’s easy to have MARKETSQUARE up and running in a minute. MARKETSQUARE comes with built-in and preconfigured image styles. You just upload your photos and they are placed in the way they should be.